Please remember, this is a general set of instructions and every different make and model of vehicle will be different. You can easily adapt these instructions to your particular vehicle. The auto headliner is attached to a headliner board that has to be removed from the car. First remove all the trim around the edge of the headliner board. Remove dome light, hanger hooks, and seatbelts that are attached through the headliner board. There may be clips that hold the automotive headliner board up in the front of the headliner board. Unclip them, and carefully remove the headliner board from the car. Once the headliner board is out of the car, remove the old material from the headliner board. You will notice that some of the foam is still attached to the headliner board. Scrape the headliner board with a bristle brush or light sand paper to obtain a smooth surface. The smoother the surface, the nicer the job will turn out. Be very careful not to damage the headliner board! Next lay the new automobile headliner fabric over the headliner board to make sure the material is wide and long enough to cover the entire headliner board before you apply any glue. You will be using contact cement, therefore, once the two surfaces make contact, you can not remove the material from the headliner board. If you have any concerns about applying the material, contact you local trim shop and have them complete the job for you. 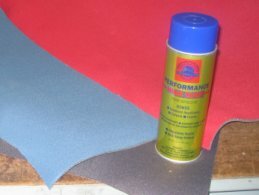 Fold back the front half of the fabric and apply adhesive to both the headliner material and the headliner board. Working with 1/2 of the material at a time makes the process easier. Lightly stretch material over the headliner board and press lightly with the palm of your hand to secure the fabric. Once finished, repeat the process with the back 1/2 of the fabric. Allow adhesive to dry, then carefully cut any holes for visors, hanger hooks, etc. Usually these holes can be cut by simply making a small X. Before reinstalling the headliner board, trim the excess fabric from the edges. If possible, you should leave 1/2 inch extra around the edge and tuck the excess under the trim. Carefully reinstall the headliner board in your vehicle and all trim to hold the headliner board in place.